The council introduced an improved kerbside recycling service in April this year, extending the materials collected to include paper, metal, glass, card and plastic. Coun Mark Holliday, Copeland's portfolio holder for customers and communities, said: “Christmas and the weeks leading up to it is a brilliant time to make the most of our collection service. There’s so much that can be recycled – everything from delivery boxes to the cans and bottles from parties and all the wrapping and Christmas cards. “As people will know, you can put out as much recycling as you want as long as it’s secure and contained so it doesn’t blow away. We’d also ask that you use the bags and boxes provided if you can. As they are designed to hook onto our lorry for fast unloading. You are welcome to collect extra ones from our Market Hall office. Please don’t use very heavy containers or oddly-shaped containers. The council has issued some useful hints and tips to help residents get the most out of recycling this Christmas. *If you have brown paper from parcels, please include it with your card recycling (not paper). *Online delivery boxes can be put into your white bag - remember to take out any polystyrene and packing tape, and flatten it down as much as possible. *For the four per cent of homes that don’t get kerbside deliveries, the council’s bring sites will be open and regularly serviced – a list can be found at www.copeland.gov.uk . 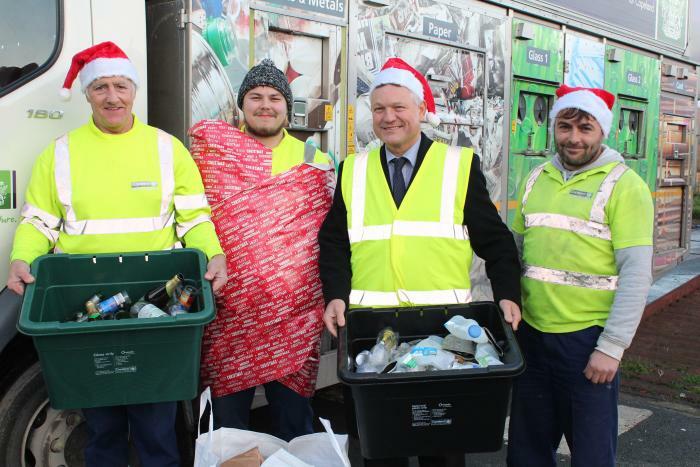 Copeland staff getting ready for Christmas recycling with mayor Mike Starkie.